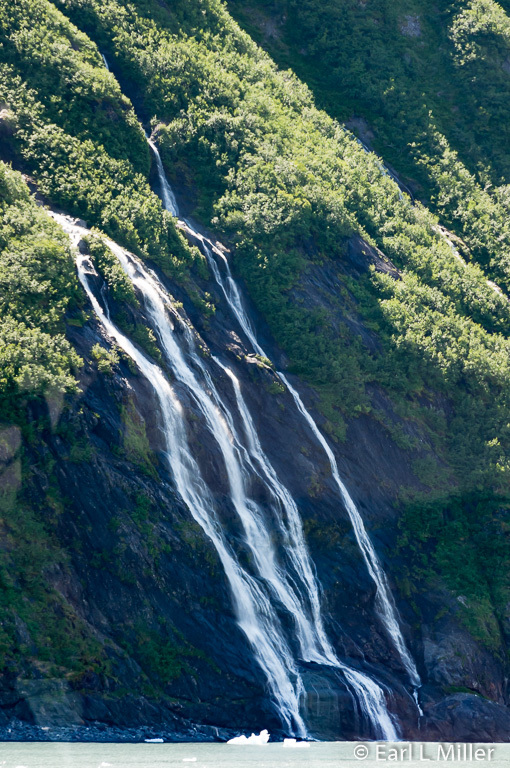 One of the most scenic areas of Alaska’s coast is Prince William Sound viewable only from the air or by water. It covers an area of 15,000 square miles. Located in the northern corner of the Gulf of Alaska, it’s comparable in size to Washington’s Puget Sound and three times the size of San Francisco Bay. 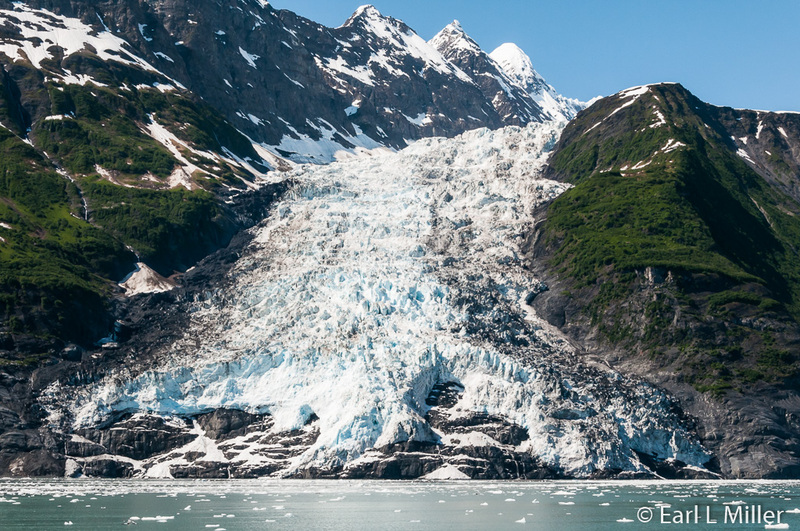 The Sound is the home of snow-capped mountains, 150 glaciers, and an opportunity to see abundant wildlife. Scanning the shores from a cruise boat sometimes leads to glimpses of black and brown bears, mountain goats, and Sitka black-tailed deer. It’s also home to 200 species of bird life including the frequently seen bald eagles and kittiwakes. The trip also provides the opportunity to spot a variety of marine life. These include Dall’s porpoise, harbor seals, Steller sea lions, sea otters, and a variety of whales ranging from Minke to Humpback. What you see changes daily since it’s influenced by the weather and wildlife activity. Two major cruise tour operators provide access to this area. We took the 5-hour 26 Glacier Cruise conducted by Phillips Cruises and Tours. 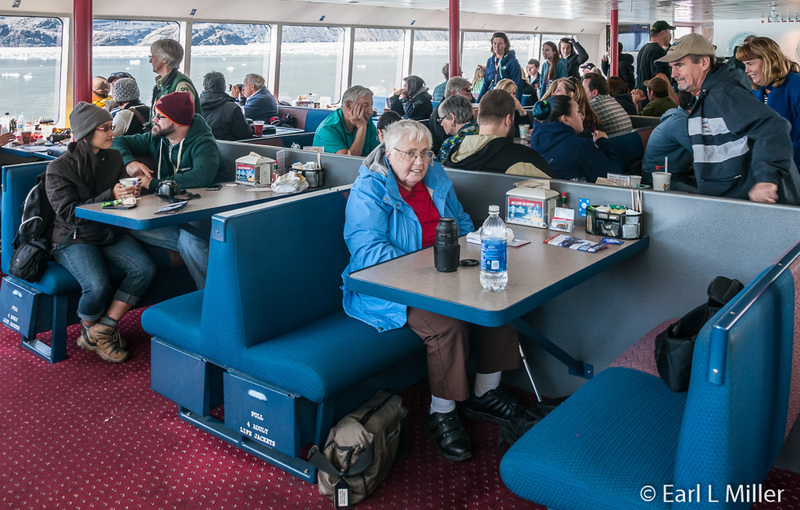 Brad and Helen Phillips started operating Philips Cruises and Tours in Prince William Sound during the late 1950's with their 85-foot, mono hulled vessel M/V Gypsy. Unfortunately, this boat was lost in the 1964 Alaskan Earthquake. 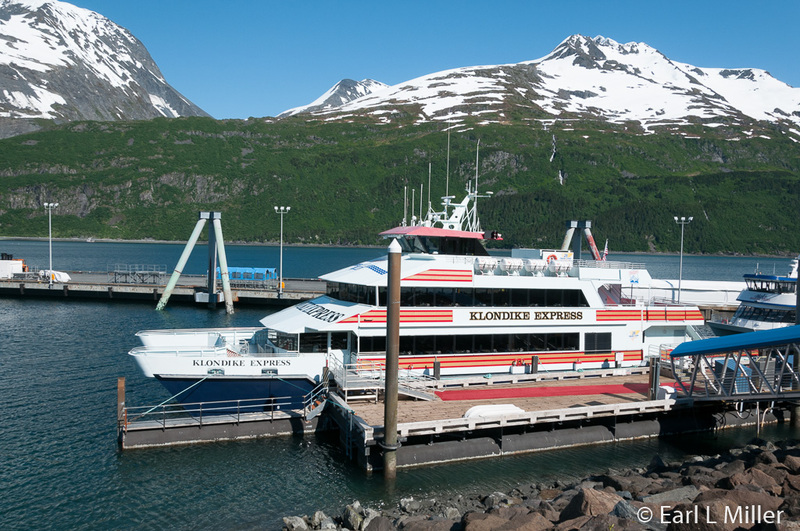 In 1985, the company pioneered the use of high-speed catamarans in Alaska. 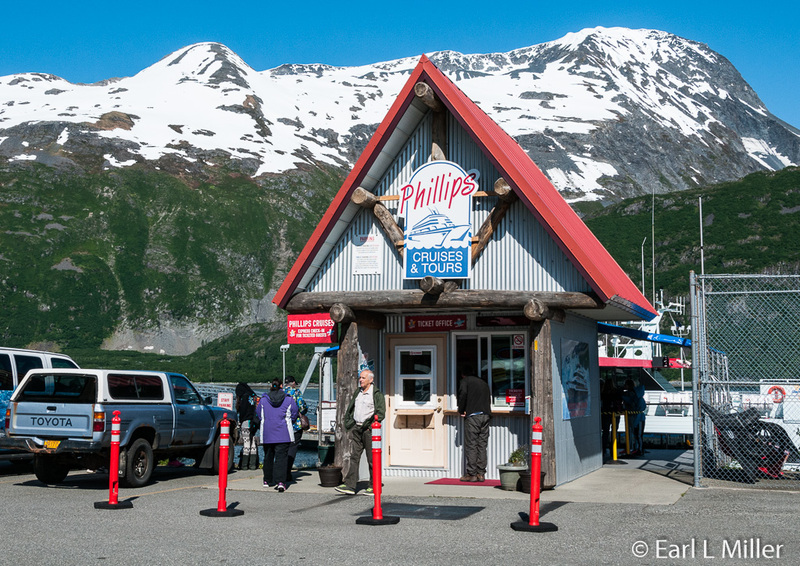 Now Phillips Cruises and Tours is regarded as Alaska’s premier day cruise business out of Whittier. The boat’s two bottom decks are enclosed and heated and include an inside seat at a table for every passenger. The third deck, an open-air observation deck with exterior bench seating, includes the wheelhouse. That cabin is accessible during the cruise with the captain’s permission. Visits are limited to four passengers at a time and only for a few minutes. The boat has a full-service saloon, galley, gift shop, and seven restrooms. The Sunset Glacier Cruise will run on Friday, Saturday, and Sunday evenings from June 16 to August 13 in 2017. Rates in 2017 will be $99 for adults and $69 for children, ages 2 to 11, not including taxes. 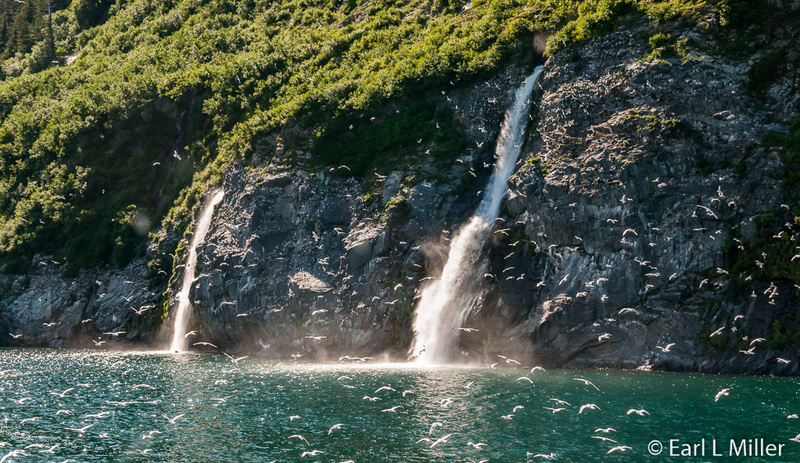 It visits Blackstone Bay where passengers see waterfalls, glaciers, and wildlife. The captain and crew provide narration, and staff serves a complimentary hot meal. The 26 Glacier Cruise, the line’s most popular, operates from early May to the end of September from 12:30 p.m. to 5:30 p.m. Traveling 140 miles in five hours, it’s the longest of the cruises Phillips runs. You’ll view Esther Passage and 26 glaciers in College and Harriman Fjord. Fares for 2017 will be $159 for adults, $99 for children, ages 2 to11. Tax is additional. 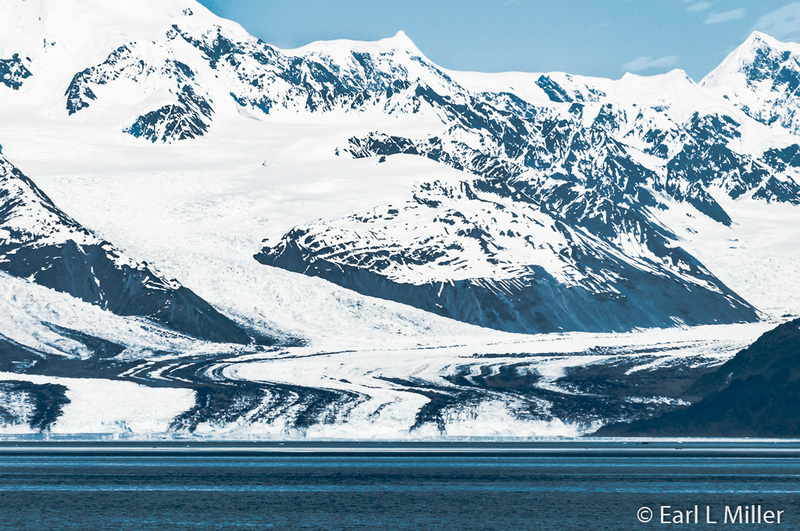 The M/V Glacier Quest runs to Blackstone Bay. It’s a 78-foot catamaran with a seating capacity of 149 passengers. It has three levels. 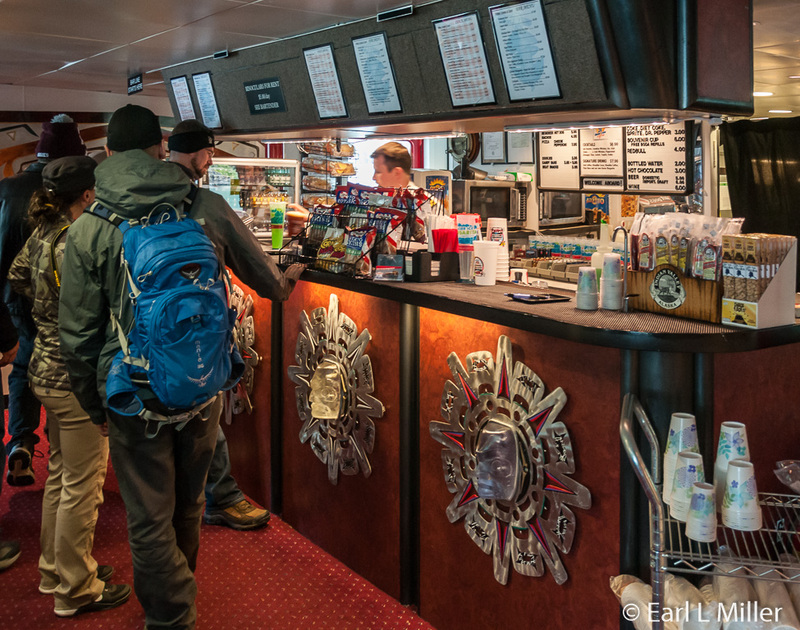 On the main deck are a snack bar, full-service saloon, and three restrooms. The second deck wraps around the boat and is home to the wheelhouse. An exterior open air observation and viewing area is on top. Cruising speed is 18 knots (21 mph.). 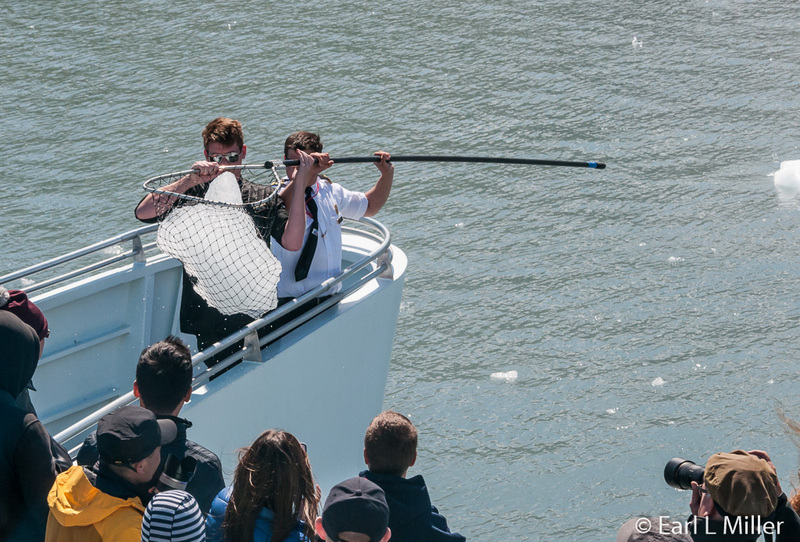 This cruise, operating from mid May to mid September, runs from 1:00 p.m. to 4:45 p.m. The 2017 prices will be $109 for adults and $69 for children, ages 2 to 11, not including taxes. 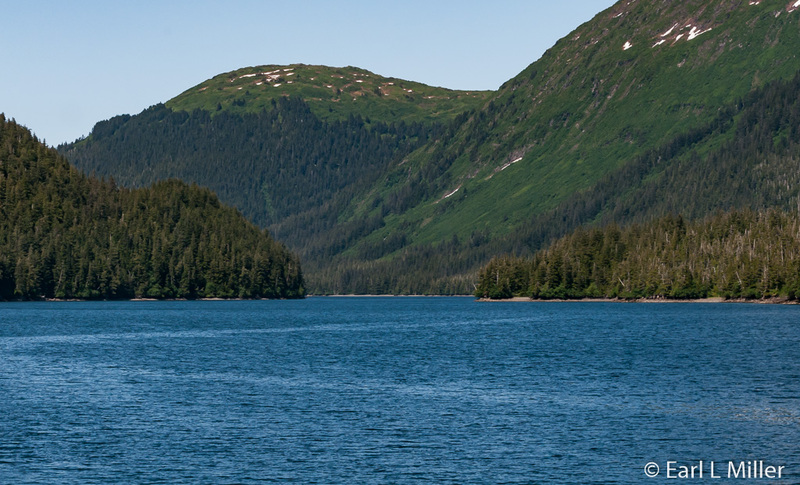 It explores 45 miles of Prince William Sound into Blackstone Bay. 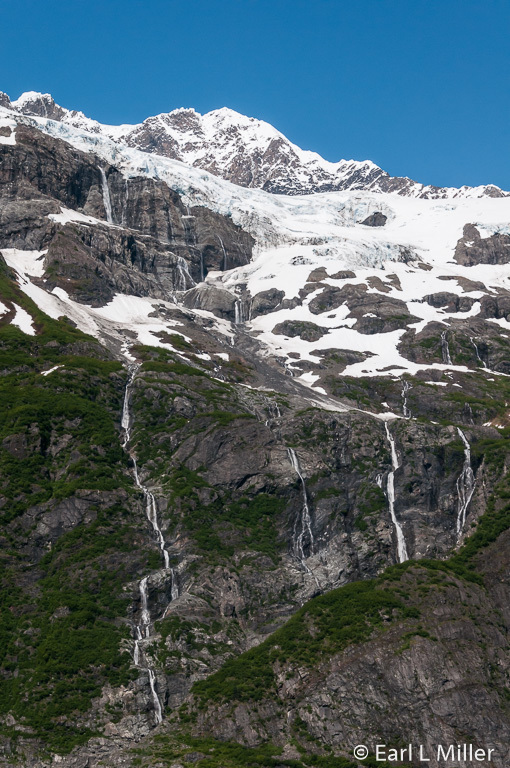 The route includes seven glaciers and beautiful waterfalls. Narration on the 26 Glacier Cruise and the Glacier Quest Cruise is done by Chugach National Forest Service Rangers. While on board, youngsters can work through a Junior Ranger activity book resulting in a badge when they agree to be good stewards of our national forests. The captain provides narration on the Sunset Glacier Cruise. 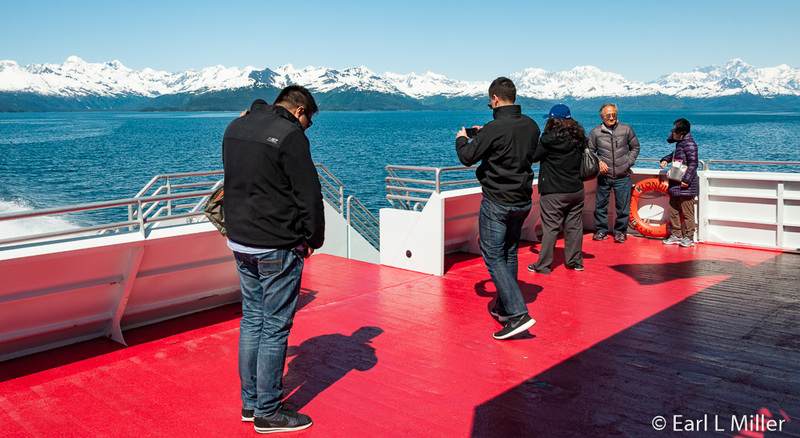 For close-up views of the glaciers and wildlife, the ships contain ample outside deck space. When the boats reduce speed or stop, passengers can visit each vessel’s bow. Full payment is expected when making a reservation. Interior seats are reserved based on the confirmation date. To accommodate those with any special physical disabilities, the cruise line should be advised 72 hours prior to travel. Neither boat has an elevator. All Phillips cruises guarantee passengers won’t become seasick. If they do, their fare is refunded. Parking ranges from $7 to $12 a day in Whittier with public parking just south of Phillips’ ticket office and boarding area. There are some handicapped spaces available. The Chugachs, native Alaskans, have lived around the Prince William Sound area for thousands of years. They survived by harvesting natural resources, fishing, and fur trading. Disasters and epidemics have decimated many of these people throughout the years. In the early 1900's, they were devastated by smallpox followed by a pneumonia epidemic in the 1930's. In 1964, the Good Friday earthquake washed away their village of Chenega. The 1989 Exxon Valdez oil spill caused extensive ecological damage that greatly affected the Chugachs’ subsistence lifestyle. Since 1741, well-known explorers have visited Prince William Sound. The first was Vitus Jonassen Bering, a Danish navigator who served in the Russian Navy. The legend is that 10,000 men took part in this expedition exploring the Aleutian Islands and the area that became south-central Alaska. Bering’s maps were some of the area’s first. He prepared the way for a Russian foothold on the North American continent. The Bering Strait was named after him. The famous German naturalist, Georg Wilhelm Steller, a member of the Bering Expedition, made landfall approximately 100 miles southeast of Whittier at Kayak Island. Steller’s name is associated with many species: Steller Sea Lion, Steller Jay, Steller Eider, and Steller Sea Eagle. Next came Russian fur traders who exploited the area’s abundant sea otters. They established villages along the area - particularly in Southeast Alaska and the Aleutian Islands. In 1778, Captain James Cook, a British explorer, arrived on the Alaskan coast. With him came such explorers as William Bligh, of Mutiny on the Bounty fame, and George Vancouver for which the Canadian and United States cities of Vancouver are named. Cook traveled through the Bering Strait and crossed the Arctic Circle, the farthest any European explorer had ever gone. In 1899, Edward Harriman brought a team of 23 biologists, taxidermists, geologists, artists, photographers and writers from New York to Alaska on a two-month discovery tour. Among the famous on this trip were John Muir, John Burroughs, and Edward Curtis, a Native American photographer. They documented plants and animals taking 12 years to publish their study. Whittier, which is located on Prince William Sound, was an excellent location to build a base during World War II. It was a deep water, ice-free port encircled by majestic mountains to shelter it from air attacks. Camp Sullivan, a military facility, was completed in 1943. Since Whittier was isolated by road, the U.S. Army started construction in 1941 of the Anton Anderson Memorial Tunnel. It opened to vehicular traffic on June 7, 2000 after an extensive conversion from being a World War II railroad tunnel. It’s the longest tunnel alternatively used by both trains and motor vehicles in North America. Two buildings were completed that housed the military. One, the 14-story Hodge Building, is now called Begich Towers. The other was the Buckner Building whose foundation was destroyed during the 1964 earthquake. It is full of asbestos so too expensive to demolish. Whittier remained an active military port until 1960. Whittier continues as a small town today. Its port is its major economic base as goods are brought in for interior Alaska. Tourism is another industry since several cruise ships visit annually. Commercial and sport fishing are strong cogs in the economy, and oyster farming is thriving. We decided on the 26 Glacier Cruise because of the vast amount of glaciers we would see. As our boat, the Klondike Express, headed east out the Passage Canal, it passed along Chugach National Forest. At 42 million acres, it’s the world’s largest temperate rain forest as well as the United State’s most northernmost and westernmost one. Susan, the United States forest service ranger on board, was our narrator. She advised that the forested area is regarded as a land wilderness area. It contains no roads or motorized vehicles. The government hopes that it becomes a National Wildlife Recreation Area at some point. Billings Glacier was the first big glacier the boat passed. It was named for British Commodore Joseph Billings, who commanded a Russian exploration and survey expedition in 1791 and 1792. It’s a glacier that starts at the top of the Chugach Mountains and terminates before reaching the canal. At this point, Susan explained glaciers to the passengers. She said that when snow becomes compacted into large, thickened ice masses, over a period of years, it becomes an ice field. The ice field is pulled down by gravity between the peaks and becomes a river of ice called a glacier. Active glaciers are always moving - advancing, receding. As they move, they pick up boulders and rocks which sculpt mountains and carve U-shaped valleys. The rocks break down into silt, the grey areas spotted on glaciers. During the Ice Age, glaciers filled in the whole area through which our boat was traveling. Three types of glaciers exist. Alpine or Hanging Glaciers are smaller glaciers that start high on the slopes of mountains and hang on the side of a mountain. Piedmont Glaciers lie at the mountain’s base. They form when glacial ice forms a fan-shaped mass at the mountain range’s foot. Tidewater Glaciers are the active ones. We were served lunch as the boat headed for Esther Island Passage. What makes this cruise line different is that a hot lunch is always included in the cruise fare. The menu changes annually. For 2017, meal choices include wild Alaska, smoked salmon chowder or a hearty vegetable chili. Both entrees are served with a fresh jubilenne salad and bread or crackers. A gluten-free, vegetarian option is also available upon request. The Passage forms a scenic channel between the wilderness of Esther Island and the Alaska mainland. Passengers were advised to keep an eye out for bald eagles and the black bears which roam Chugach National Forest. The forest is primarily populated by Sitka spruce and Western hemlock. Susan said that the best way to tell the difference between the two tree species is to shake hands with them. Spruce is prickly while hemlock is soft. At the South Esther Island State Park, you can kayak, camp, fish, or visit a fish hatchery. 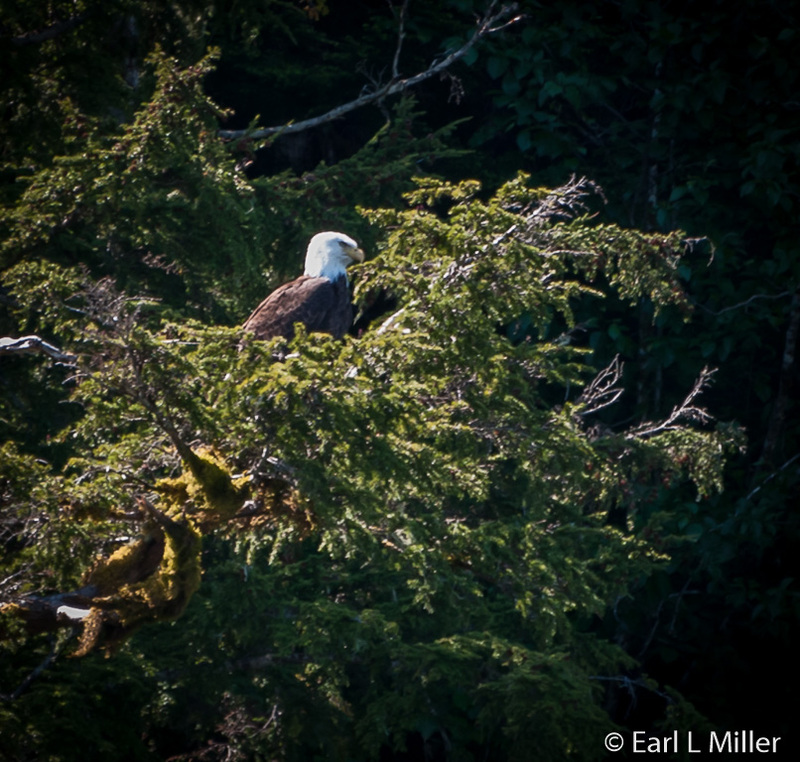 As our boat passed, we eyed a bald eagle at the top of a tree. Susan also pointed out two humpback whales blowing on the starboard side of the ship. They’re recognized by giant spouts seen from great distances. Humpbacks are baleen whales which feed on the ocean’s smallest creatures. Their giant flippers sometimes reach 30% of their entire length. They migrate - spending the winters in Hawaii, where they give birth, before returning to Alaska. A Minke swam along our vessel. Minkes, normally shy whales, are usually solitary. About half the size of humpbacks, they are the smallest baleen whales in North Pacific waters. Minkes are recognized because of their weak but bushy visible blow and because they don’t display their tail flukes when diving. Susan pointed out two Dall’s porpoise. Dall’s are fast swimming porpoise that inhabit the Northern Pacific Ocean. They travel in pods of 10 or 20. They create a distinct ‘rooster-tail’ splash when traveling quickly and do not bring their body entirely out of the water. 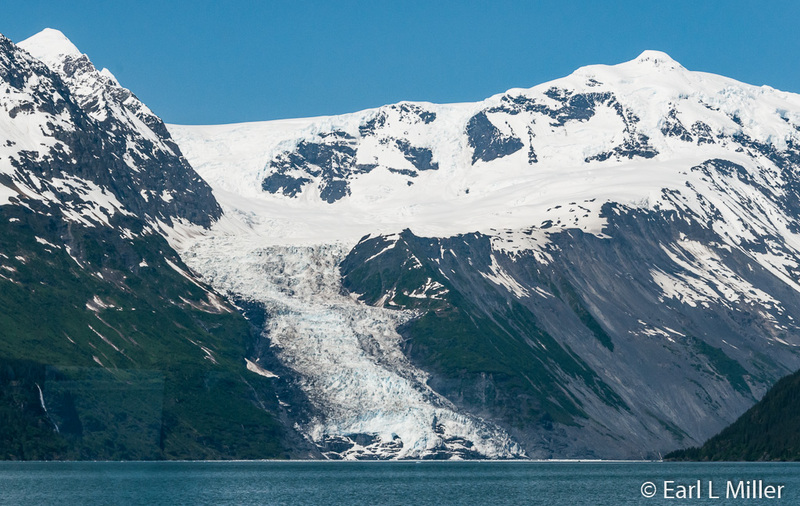 In addition to the marine life, we also saw three active glaciers. Sometimes the cruise goes to Egg Rocks Island which is the home of sea lions. Our cruise skipped this location since no sea lions had been spotted there recently. The boat passed mountains that were 4,000 to 4,500 feet high. Glaciers were noticed at a lower height here. Then Susan pointed out 9,000 foot Gilbert Mountain. 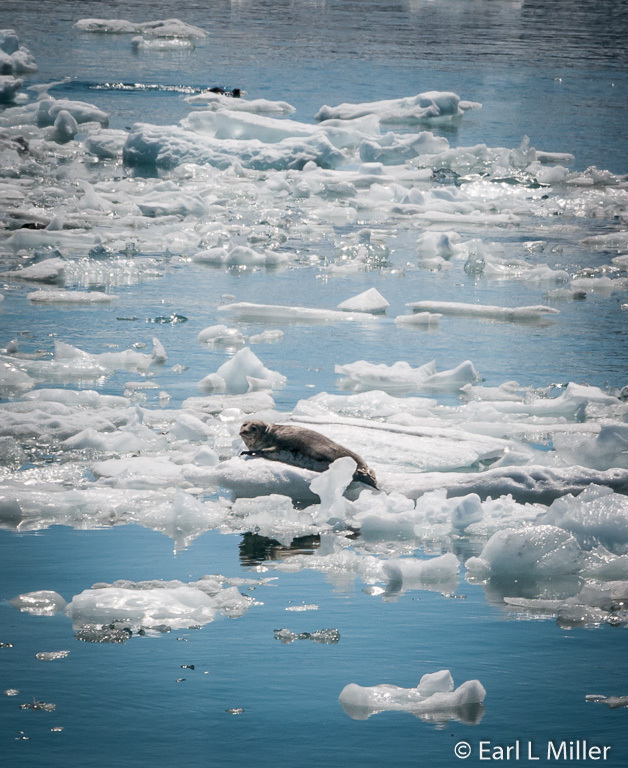 At the end of Esther Pass, we spotted a fishing boat and a raft of about eight sea otters. Sea otters, which are part of the weasel family, love to float on their back. They have thick fur which they clean a lot of the time. It was because of this fur that the species was almost decimated. The boat passed into College Fjord, in the Sound’s northwest corner, where the glacier viewing is second to none. 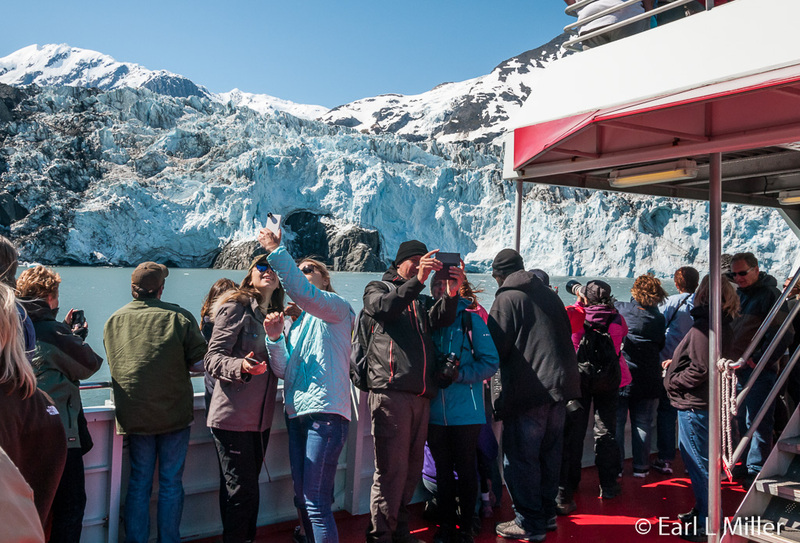 Passengers view more than a dozen major glaciers with eight seen from one location. The fjord is surrounded by rocky Alpine peaks, almost always snow capped. It is hard in the summer to tell the mountain’s snow pack from glaciers on these mountains until the snow melts at the summer’s end. Some mountains were rounded during the Ice Age. Others have lunateos, jagged parts that stick up that weren’t covered by glaciers. Glacial crevasses are cracks in the ice field caused by glacial movements. They appear blue because the ice reflects blue light. With rain, the crevasses grow. Susan said that the bottom of a glacier is like molasses. It is softer and warmer than on top. Five tidewater glaciers in this area reach the salt water. The glaciers in College Fjord are named after East Coast colleges. Those on the northwest side were named for women’s colleges Radcliffe, Smith, and Vassar with those on the southeast side named for men’s colleges, Yale and Harvard. Edward Harriman named them during his 1899 expedition which included a Harvard and an Amherst professor. Stretching for miles, these tidewater glaciers tumble down from the mountains and through valleys where they dip into the fjord’s waters. Sometimes you can see them calve as pillars of ice drop into the sea with a huge splash and crashing sound. At times, passengers may be lucky enough to spot humpback whales. Humpbacks are baleen whales and have up to 400 fibers hanging down inside their mouths, each about two feet long. Their baleen is like fingernails in keratin composition. Susan explained that whale flukes are so distinctive that researchers use them like fingerprints to identify individuals. Our ship approached Barry Arm to see more glaciers. Three glaciers, Cascade, Barry, and Coxe, form a horseshoe shape at this location. The biggest one was Cascade Glacier while to the right was Barry Glacier. At one point, these two were connected. We got close to Coxe Glacier which isn’t active (moving). Then our catamaran motored down to the Harriman Fjord housing the Harriman, Surprise, and Serpentine Glaciers. Surprise is an active glacier where the boat spent almost an hour. At this location, the crew fished for ice. They brought up small pieces which passengers were allowed to taste. 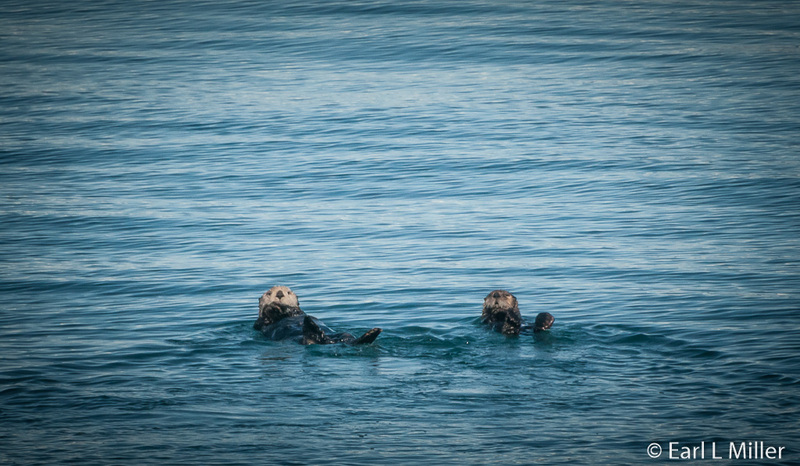 On the way to Surprise, passengers spotted another sea otter and a harbor seal. On the way back, Susan pointed out several more sea otters. It was back to Barry Arm where the boat picked up three kayakers who were off duty crew members. 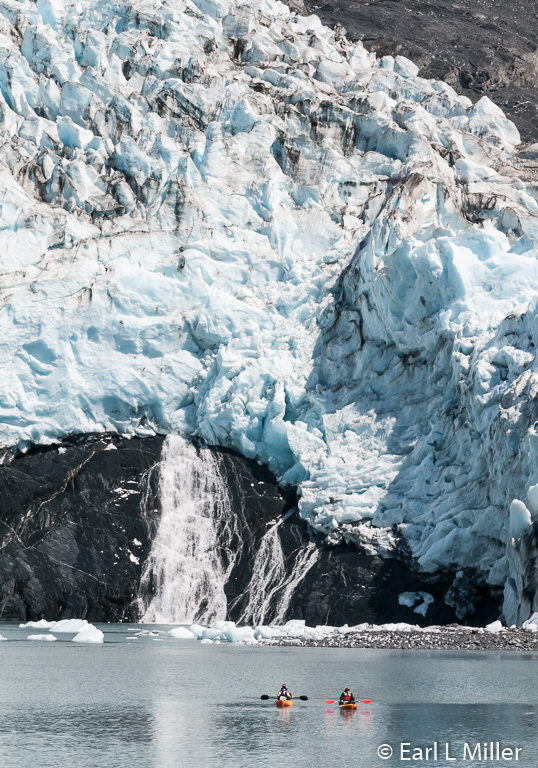 Our catamaran got close again to Coxe Glacier with passengers spending time admiring the waterfalls. On our way back to Whittier, we passed Tebenkof Glacier. Tebenkof is an 8-mile long glacier with a smooth white top. The boat stopped so its passengers could admire three more otters. These animals weigh around 60 pounds and are 4-1/2 to 5 feet long. It was explained that sea otters carry their pups on their chest. When their babies are born, mama otters clean their pup’s hair and blow air bubbles into the babies’ fur. Then the pups can float in the water by themselves. Otters enjoy clams, sea urchins, and all kinds of shellfish. They sometimes dive down as much as 250 feet. They retrieve their prey and smash it on a rock to break the shells open. They must pull up 80 pounds of shellfish to eat 15 pounds to survive. If an otter eats too many red urchins, its teeth can turn red. As the boat returned to Whittier, Susan provided information about the 1964 earthquake which partly changed Prince William Sound. The north side of the Sound dropped 10 feet while the south side rose 38 feet. Huge mud slides under the water resulted in three tsunamis where the effects were felt down to California. She also spoke about the 1998 Exxon Valdez Oil Spill where 108 million gallons of crude oil were released when the ship ran aground on Bligh Island. A storm, the third day after the accident, blew oil all over the Sound. The boat passed a couple of Dall’s porpoise that were playing. This species is found only in the North Pacific. Its coloration is black and white, similar to a killer whale. Their favorite foods are schooled fish like herring, mackerels, and anchovies. They are prey to killer whales and white sharks. Next stop was a kittiwake bird rookery located just across the bay from Whittier. 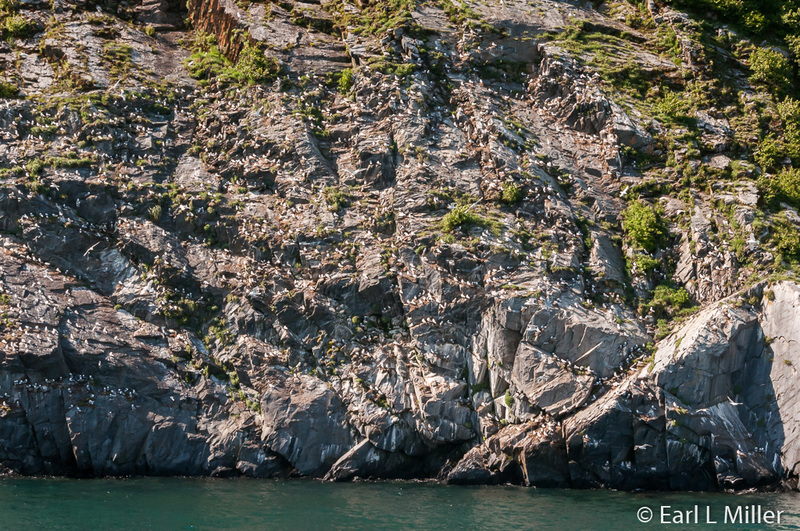 At this site, more than 10,000 birds inhabit the rocky cliffs each summer to lay their eggs. Thousands were flying around. They fish constantly in front of the rookery where they train their fledglings in the survival skills they’ll need before flying south for the winter. The birds are smaller seagulls that have black legs and black tips on their wings. We also saw two more bald eagles. The boat also passed islands where fox farming had been popular though not necessarily profitable. Blue foxes were raised on these islands to keep them from fleeing since this species cannot swim. The peak was in 1925 when 34 farms actively participated. The 1929 stock market crash led to a fox farming decline with the last fox farm closing in 1959. You can arrange with the cruise company to include a bus or a train trip to the port. Many people prefer to drive from Anchorage. There is one hitch - the Anton Anderson Memorial Tunnel. This 2.5 mile tunnel, constructed as a railroad tunnel during World War II now serves cars, recreational vehicles, and trucks subject to size restrictions. The tunnel operates on a one-way basis, with a change in the travel direction every 30 minutes for vehicular traffic. At certain times of the day, the train takes priority and will cause vehicle traffic to pause while it transits the tunnel. Traffic lines up and enters by vehicle type. 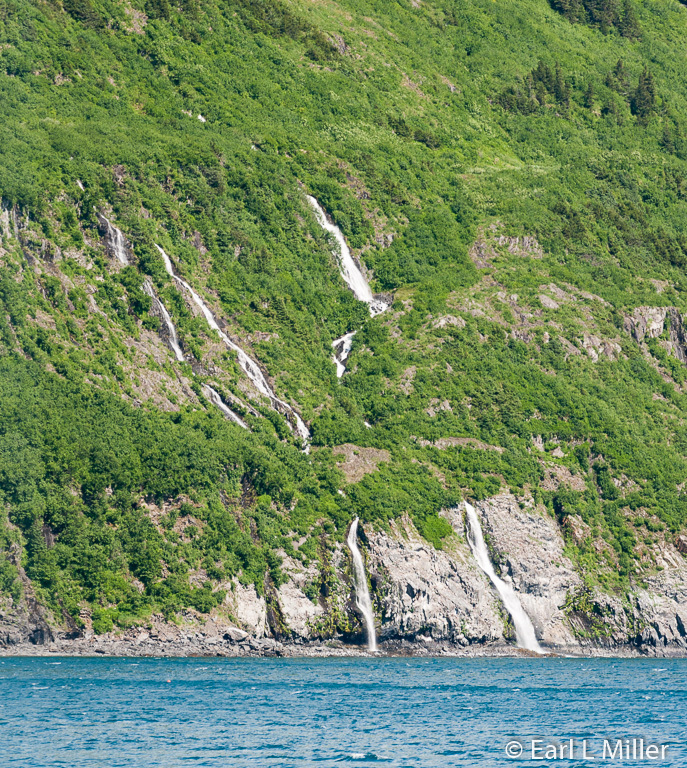 To make the cruise on time, allow 1.5 hours to drive from Anchorage to Whittier on the Seward Highway. The tunnel is closed from 11:00 p.m. to 5:00 a.m so it’s essential to watch the clock so that you don’t spend the night in Whittier. Phillips strongly recommends that their 26 Glacier guests enter the tunnel at 10:30 a.m to ensure they get to their cruise on time. If passengers arrive late and the boat has departed - no refunds are available. The toll fee, ranging from $13 to $38, is collected when you go to Whittier. For further information, go to the tunnel's web site.